This article is restricted to growing sweet (bell) peppers in the UK. It does not include chilli peppers which need to be treated slightly differently. Sweet peppers are from the same plant family (Capiscum) as chillies but they have no capsaicin so are not hot to taste with a zero rating on the Scoville scale. They are highly nutritious especially when red. The classic shape, similar to a bell and about the size of a man's fist. These are the ones you commonly see in the supermarkets. The fruits start of as green and if left long enough turn red. A twist on the classic sweet pepper are varieties of different colours. Green (they stay that way even when ripe), orange and yellow, even deep purple are some of the available colours. Longer and narrower than normal, these sweet peppers look like large chilli peppers but really do taste sweet. The skin tends to be thinner. 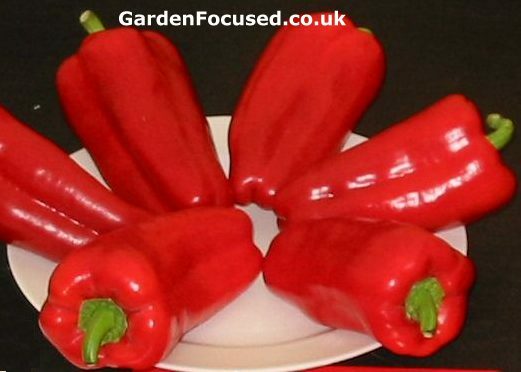 Whatever the shape, size or colour make sure that you buy only seeds specifically marked as sweet or bell peppers. The Americans especially tend to use different words and it's very easy to end up with a small very hot pepper plant when you actually want a sweet pepper. The Latin name for sweet peppers is Capiscum annuum which is a tropical plant. Sweet peppers tolerate colder conditions better than hot peppers. Seeds germinate within the range 18°C / 64.5°F to 32°C / 89.5°F, outside of that range germination rates fall very rapidly. The ideal temperature range for germination is 25°C / 77°F to 30°C / 86°F. Plants grow best in a daytime temperature range of 19°C / 66°F to 28°C / 82°F. Plants grow best in a night time temperature range of 15°C / 59°F to 20°C / 68°F. These slightly lower night time temperatures help the fruits to set. Sweet peppers are 'day neutral' plants (i.e. daylight length is not a significant factor in their development). Seed will keep for 3 years when stored in appropriate conditions. Seeds take 8 to 21 days to germinate in good conditions. Depending on variety and conditions, flowering will begin 70 to 80 days after seed is sown. Sweet pepper flowers open up like clockwork two to three hours after sunrise and last for only a day or so. About 45% of flowers set fruit. Sweet Peppers originate from South America and thrive in warm and sunny conditions. In the UK these conditions don't occur for long enough to ensure germination through to fruit production. Some form of artificial heat is almost always required at the beginning of the year and in cooler parts a greenhouse / polytunnel or conservatory is essential. If you plan to grow sweet peppers in the great outdoors then growing them in containers is the only sensible option. Use normal multi-purpose compost. In polytunnels or greenhouses however they can be grown in containers or directly into the ground. Dig the soil well before planting and add lots of well rotted organic matter to help drainage and at the same time help water retention. When growing sweet peppers in the ground you need to practice good crop rotation in order to avoid a build up of pests and diseases. Click here for our page dedicated to crop rotation. Germinating the seeds - the high temperatures needed to quickly germinate these seeds means that the average gardener achieves this stage inside a heated house. It takes approximately 10 days for the seedlings to appear. Growing on the seedlings until they are nearly ready to be moved into a polytunnel / greenhouse or outside in larger containers. This will normally occur inside a heated house or conservatory. The plants should be 'grown on' in pots filled with multi-purpose compost. Harden off seedlings. This should occur where they can easily be taken inside if cold weather is predicted. Move to final position in large containers in a protected and sunny position or in a greenhouse / polytunnel (see previous for soil conditions). Make sure that the plants will not be shaded by other plants later in the growing season. Fill 7cm / 3in wide pots nearly to the top with moist multi-purpose compost and gently firm the compost down to ensure it is flat. 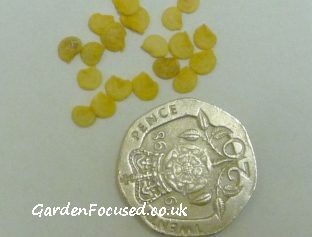 Place two seeds in each pot and cover with a thin layer of compost, half to one centimetre. Pat the surface of the compost down gently to ensure the seeds are in contact with the compost. Place them in a warm position inside the house, ideally around 22°C / 72°F during the day time, a few degrees warmer would be even better. The pots can be stored in either light or dark conditions but it is best to either place them in a propagator or cover with a plastic bag to stop the surface of the compost from drying out. Check every couple of days and water the surface lightly if it does show signs of drying out. The seedlings should appear above ground level in 8 to 21 days depending on the variety and the growing conditions. Immediately the seedlings appear remove the plastic covering and move them to a sunny warm position but out of direct sunlight for the first couple of weeks. Try to maintain a minimum day time temperature of 18°C / 64.5°F although 22°C / 72°F would be even better. The germination rate of sweet pepper seeds is good so some of the pots will have two seedlings in them. The excess seedlings can be gently teased out of the compost using their leaves and then placed in other 7cm / 3in pots filled with compost to grow on as normal. Start the process off at the same time you would normally sow the seed directly outside. Place the seeds on a damp paper towel in a bowl or container and gently pat them down. 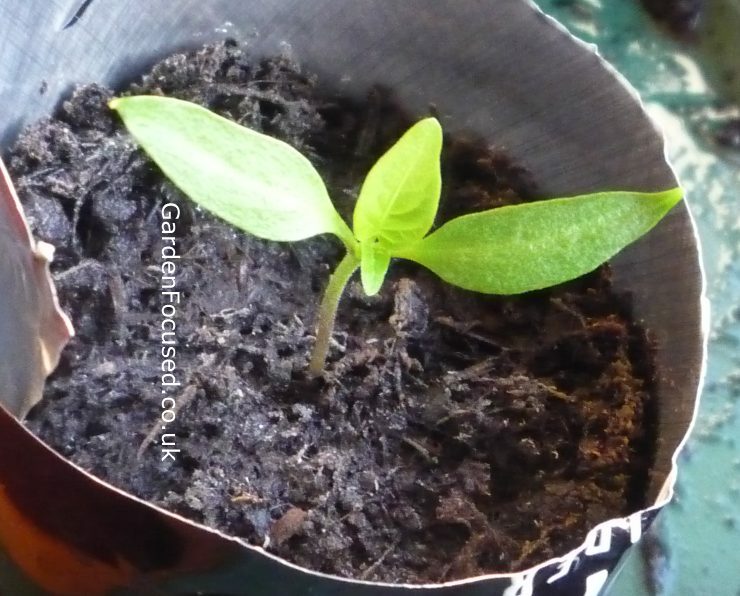 Cover with cling film to prevent moisture loss (the cling film should not be touching the seeds) and place in a warm area inside the house, a temperature of around 22°C / 72°F is ideal. Keep the paper towel moist at all times. The seeds will take on average ten days to germinate, if they haven't geminated after three weeks using this method then suspect that they never will. In this case buy new fresh seeds from a reputable supplier and start the process again. Germinated seeds will sprout a tiny white root which indicates they are beginning to grow. The roots are difficult to see on white paper towels so keep a good watch on them at least once a day after the first four days. Immediately the seeds have germinated, sow them as described above. The plants prefer to be grown on with a day time temperature of around 22°C / 72°F and with as much light reaching them as possible. If you grow them on a windowsill turn the pots at least half a turn every day to stop the plants growing towards the sun. Some time around the March week 4 the plants will have filled their existing pots and need to transferred to larger ones. Pots from 12cm (5in) to 15 cm (6in) wide are an ideal size. Set the plants 5cm (2in) or so deeper in the new pots compared to their previous depth. This will encourage stronger roots and help to stabilise the plants when they grow larger. One week before setting the plants out in their final position, around the first week of June, harden the plants off for a week. This will gently acclimatise them to outside conditions and avoid shocking them. Plant them in their final position only when every danger of frost has passed and the cooler weather has also passed. A good time is the second week of June. If you have a greenhouse or polytunnel this can be done a couple of weeks earlier. Position the plants in full sun and in a position protected from wind. If you are planting out into open ground rather than a container, allow 45cm / 18in between each plant. If planting in containers a 30cm / 1ft wide one is the minimum. The larger the container the larger will be the crop of sweet peppers. Larger pots will also require less frequent watering. We would suggest that a 45cm / 18in wide pot is a good size. Again, when placing the plants in their final container plant them 5cm (2in) or so deeper in the new pots compared to their previous depth. Watering is the primary job for healthy sweet pepper plants. They like the soil to be moist at all times but never water-logged. 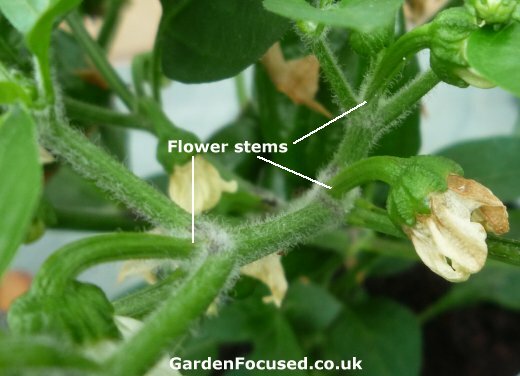 Feed with a tomato type liquid fertiliser every two weeks at the rate recommended on the packet - start feeding as soon as the first flower buds form. If the plants exceed 35cm / 14in high pinch out the uppermost growing tips to stop them becoming leggy. I have been asked if it is necessary to pinch out the "suckers" which appear between leaf and stem joints. Our advice would be don't pinch out sweet peppers other than to restrict their height as described in the previous paragraph. You may well end up pinching out the flower stems by mistake. See the picture below. 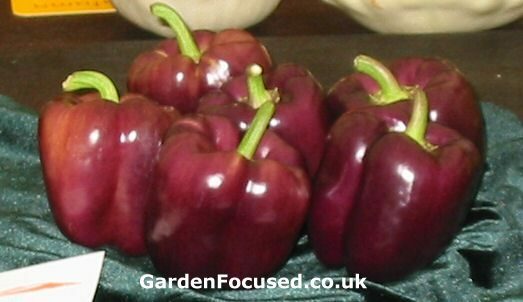 Peppers are ripe when they turn the colour expected for the variety you have chosen. As a very general rule you can expect sweet peppers to ripen 120 days or so after the seeds are sown but this does vary by variety. 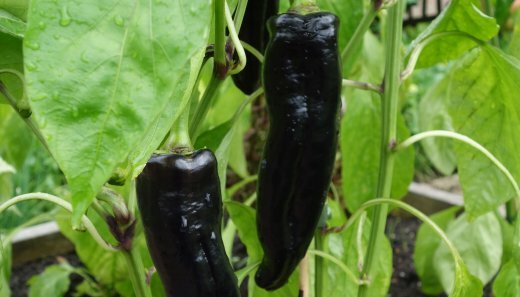 It's quite possible to harvest sweet peppers before they are fully mature, this will provide an earlier first crop and also concentrate the plants energy into maturing the remaining ones better and quicker. If foliage is blocking the light from the fruits remove it, the plants need surprisingly little foliage to ripen the fruit once the plant is established. Ripe sweet peppers will store in the fridge for about a week.